If you're job hunting or considering a new career then it is a good idea to know where jobs are located for the field in question. If you live in Hawaii and have an interest in going to college Petroleum engineering then it would be good to know that most of the jobs are in Texas. 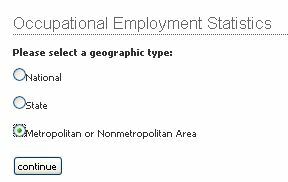 Or if you're a recently unemployed petroleum engineer then it would be a good idea to find out what locations employ the most people in your field so you know where to target your job search. 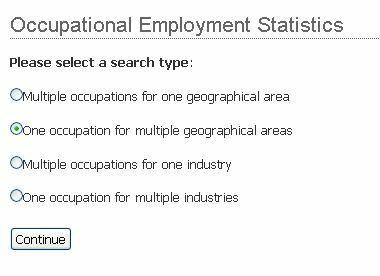 Today I'll show you how to find out how many jobs for a given occupation are in individual states and metropolitan regions. 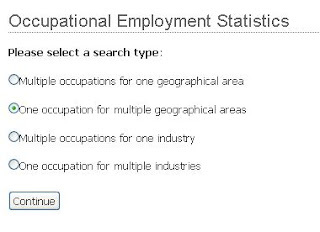 The Bureau of Labor Services (BLS) site for Occupational Employment Statistics has specifics on individual occupations. 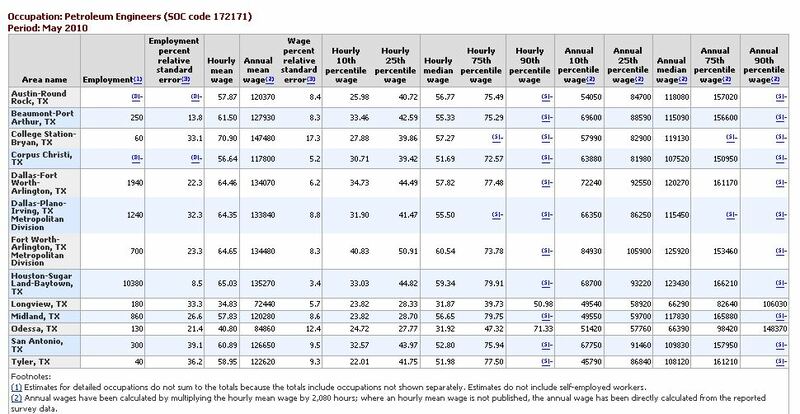 They break down data for total employment and average earnings for individual occupations. If you scroll down the page to the OES databases then you can get to the 'multi-screen data search'. This will get you to a multi-step wizard of sort that will let you select the data you want. 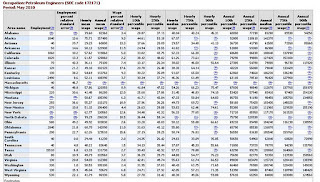 We'll walk through it step by step to show you how to find where jobs are for a specific occupation. 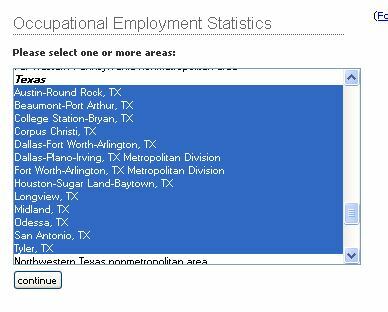 First lets find out how many jobs for a given occupation are in each state. 2) Pick the occupation. 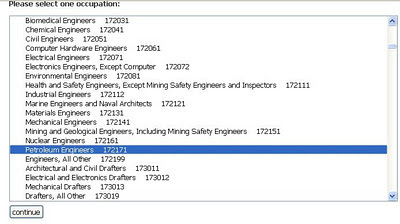 On the second page you need to pick the occupation in question. 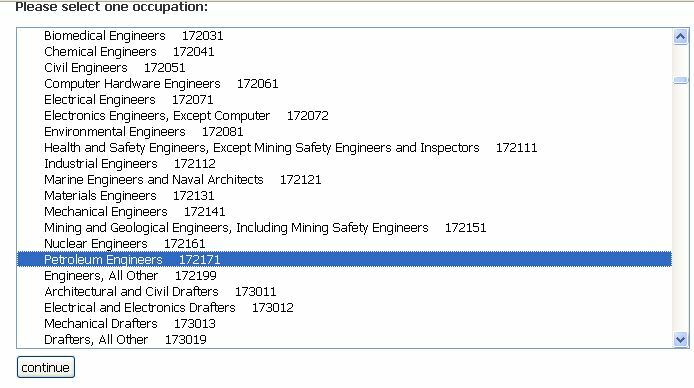 The list is broken into major fields and with individual occupations listed under each field. Skim through the list till you find the occupation in question. I'm going to use Petroleum Engineer as an example. Its listed under the broader category of Architecture and Engineering Occupations. - National simply chooses the whole country. 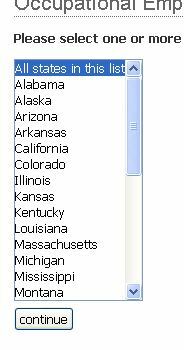 You can pick individual states or all of them with the 'all states in the list'. 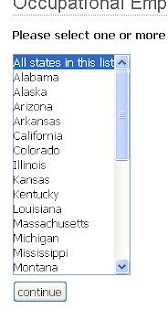 To pick more than one state hold control while you right click. This will let you select specific metro areas. The metro areas are broader than just a single city and include the surrounding suburbs. Not all metro areas will be available but the major ones should be covered. Since I'm looking for how many jobs are in each state I'll pick the states. On this step I can pick 'all states' or choose individual states. I will just go ahead and pick 'all states' to see the whole list. The final step lets you choose what data you want : Employment, hourly wage data and annual wage data. I just pick 'all data types' to get it all. But you can selectively chose to only look at the specific items. 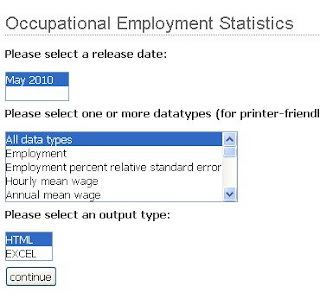 You can also select to get output of HTML or EXCEL. 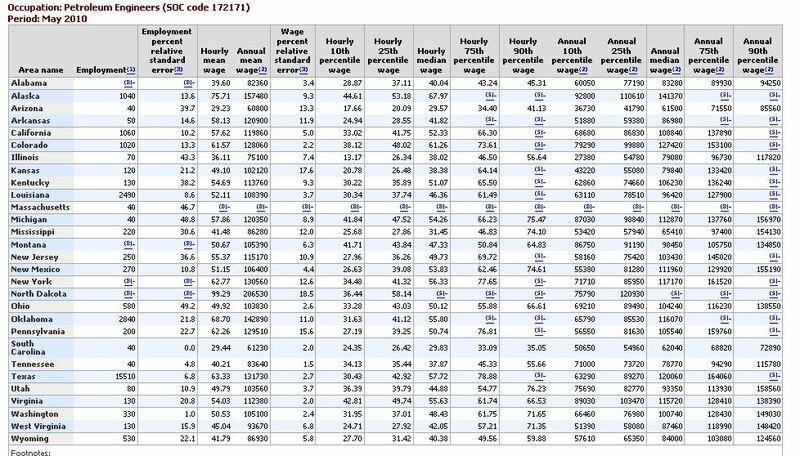 Now we know how many Petroleum Engineers are employed in each state and what the average wages are for each state. The first two steps are the same. 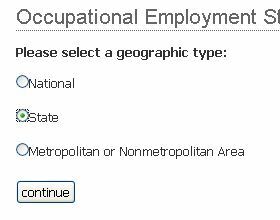 2) Select the occupation. We'll look at Petroleum Engineers again. 5) The last step remains the same and you can pick the type of data and output formula. I'll ask for all data in HTML. You can repeat these steps for any individual occupation for any given set of states or metropolitan areas.